First Row- Sooji ka halwa, Mooli ka kas, Dahi vade, and Kale chane. Second Row- Masala Arbi, Aloo Matar, Khatta meetha kaddu, Boondi ka raita. Third Row- Khatti chutney, Kheer, Dal poori, Aloo tamatar ka rasa. Halwa's are special kind of desserts, which are usually ghee (clarified butter) based. The word, Halwa has come from Arab culture. In India, there are a large variety of halwas - Gajar ka halwa, Moong dal halwa, Aate ka halwa etc...This is a delicious preparation for semolina (sooji) ka halwa..
Kale Chane also called as Black/Bengal Grams are very rich in protein. In Northern India there is a tradition to make chane with halwa andpoori for Navmi pooja( a ritual). It is a very delicious and low fat preparation so you can make it any time for snacks/ breakfast. Sweet and Sour Pumpkin is a yummy preparation from North India. Since Indian pumpkin (kaddu) is hard to find in western market, the other options to make this preparations are acorn squash, or Zucchini/Courgette which are easily available all over the world. 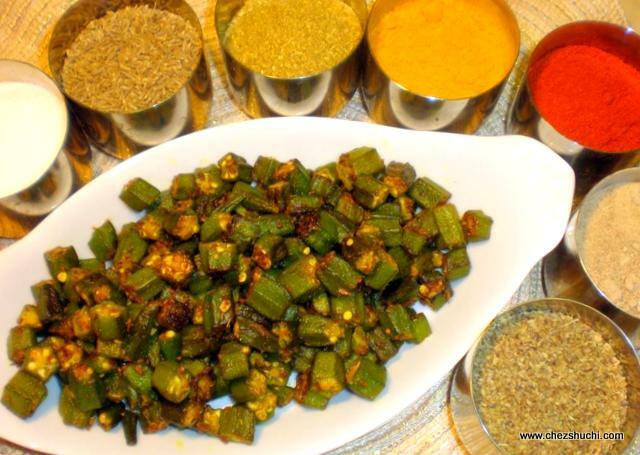 I have used a variety of squash ..
Aloo matar –This is a dry vegetable preparation of potatoes and green peas. In winter usually the markets are flooded with new baby potatoes and green peas are also in abundance. Green peas are rich in protein and also a good source of iron, thiamin and fibers. ..
Arbi is also known as arabi, toro, or colocasia. It is a summer vegetable and resembles a small potato. I use ajwain (carom) seeds for the preparation of arbi as it hepls in digestion of this vegetable. This is a very delicious preparation and goes with roti or paratha..
Moong dal dahi vadas are light and yummy variety of vadas. Vadas are deep fried balls of lentil paste. In dahi (curd/yogurt) vada, fried lentil balls are soaked in the warm water to remove the oil. Then they are soaked in dahi (curd) for 3-4 hours so the vadas absorb the yogurt ( dahi) . It is a delicious and healthy chaat item..
Pooris are the deep fried Indian breads made with wheat flour. Poori are usually made for the festivals, ceremony, parties, etc, but there isn’t any rules; you can make pooris when you feel like eating them. Let’s make the pooris for Navmi pooja..